Ankit Dyeonia from Pathankot, B.E. - B.Tech Graduate. Ankit Dyeonia is Computer Science Engineer and currently have no work experience. C C++ JAVA MANUAL / AUTOMATED .. SEARCH ENGINE OPTIMI.. VISUAL BASIC ORACLE & MS ACCESS D.. MICROSOFT OFFICE AND..
are one of expert skill area's of Ankit Dyeonia . 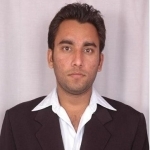 Ankit Dyeonia is working in IT Software industry. ORACLE & MS ACCESS D..